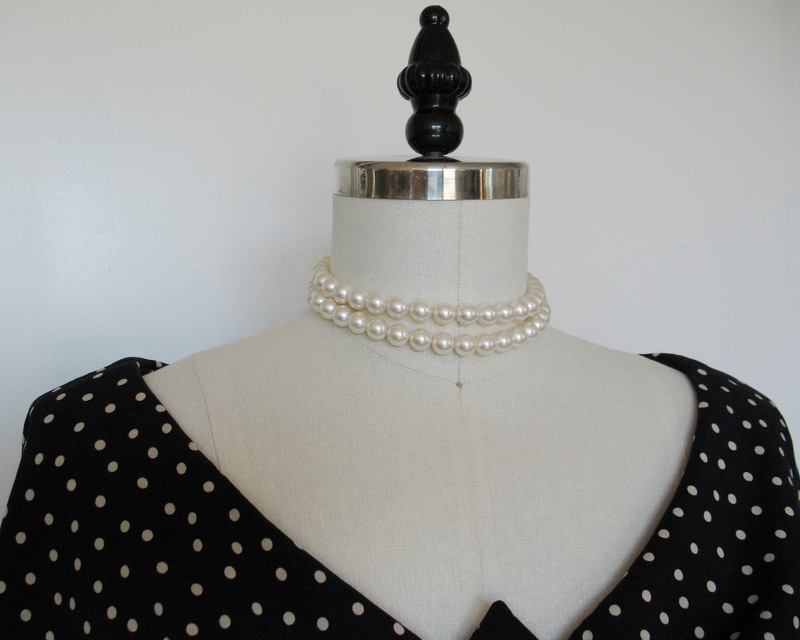 An ivory and navy polka dotted dress definitely needs a strand of pearls! 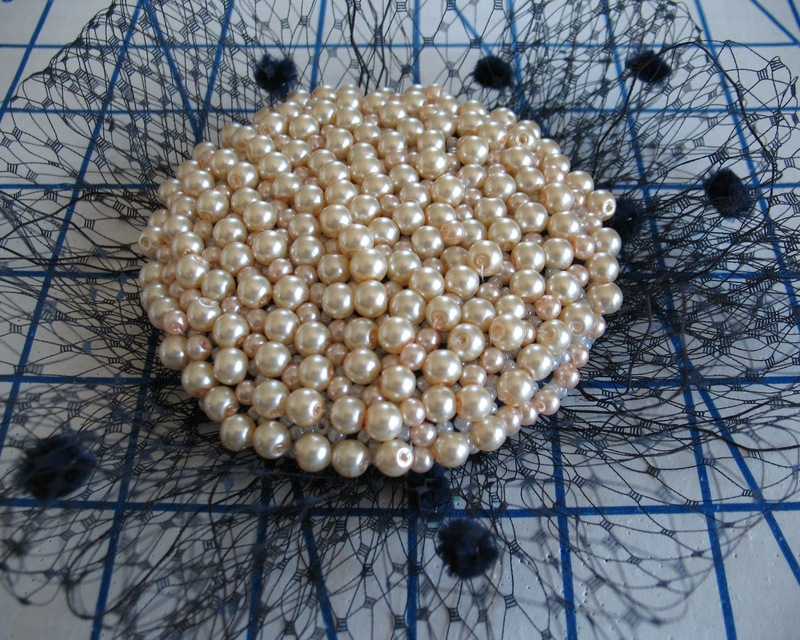 I have come across quite a few vintage images, but have never been able to find a double strands of pearls of my own. The simple solution was to make one! I rescued a clasp from an old strand of costume jewelry in terrible condition, added a bit of silk thread, and this is the result. 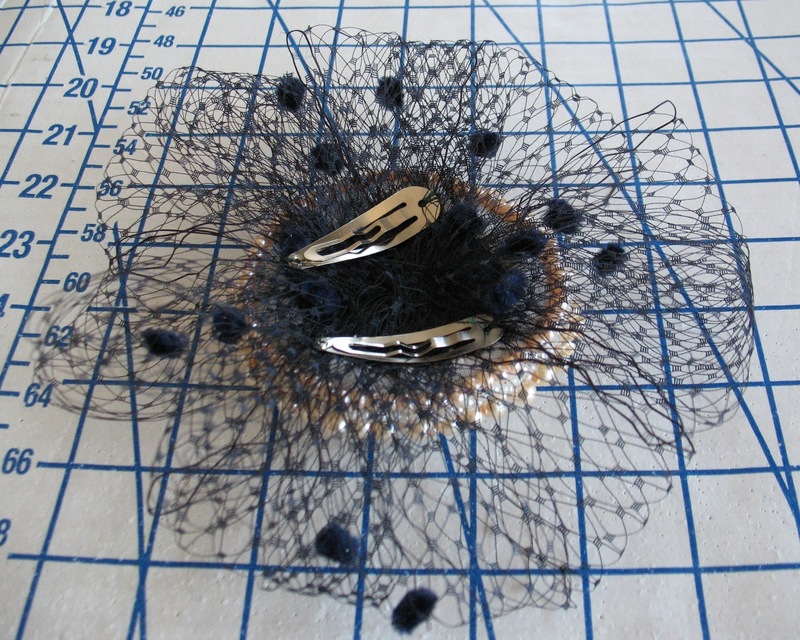 I also knew that I wanted to make a hat or some sort of hair ornament for this dress. I purchased some Russian veiling with the thought that I would need a suitable navy for my hat. 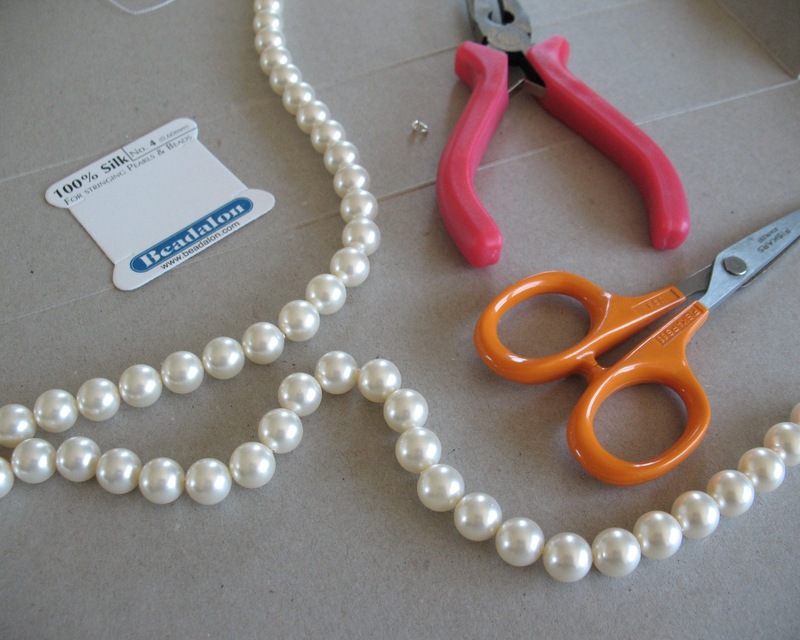 And while stringing the pearls, I realized that I should continue the theme. Out came my stash of glass pearls. They do not match the necklace, but I had plenty of them in varying sizes. And it went so much more quickly than beading with tiny seed beads! 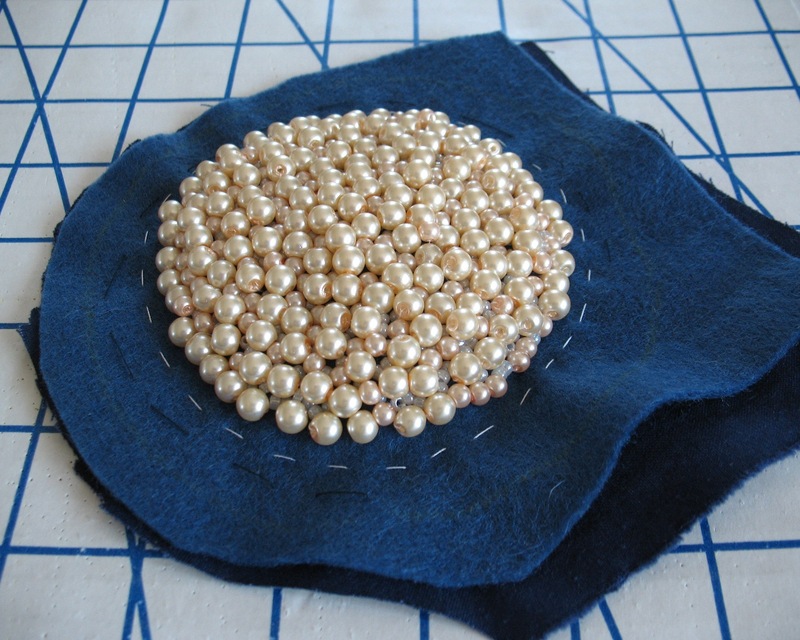 I started with a piece of felt, but decided the weight of the pearls needed more oomph, and added a scrap of cotton before I started stitching everything down. The 6mm beads were stitched first, followed by some 4mm beads to fill in the spaces, and then I added a few seed beads for more coverage. 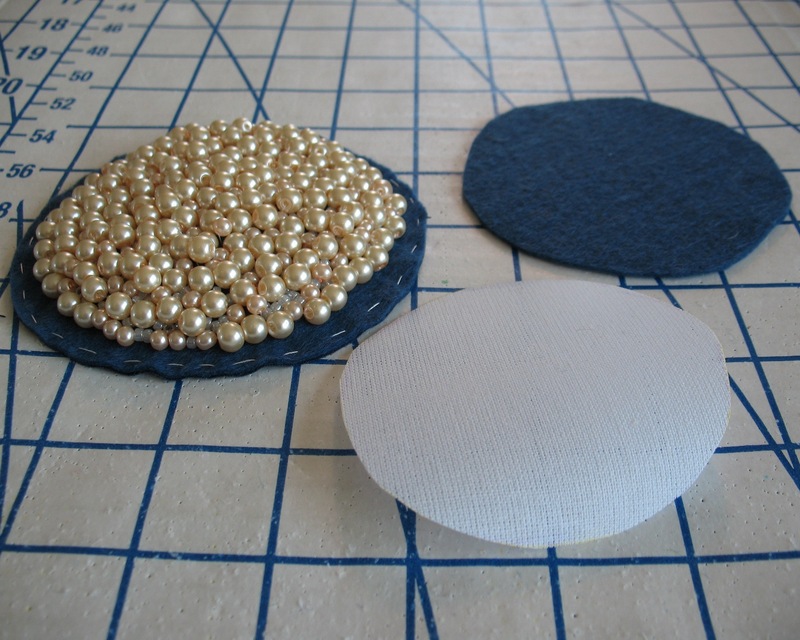 A circle of buckram was added to the back, along with another layer of felt to keep the thread nest contained! 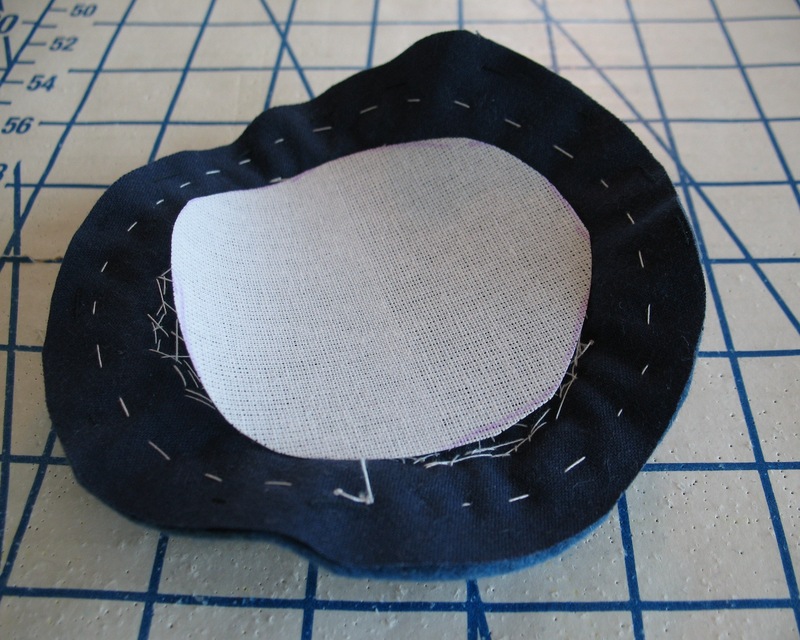 The edges were trimmed, tucked under, and that last layer of felt stitched in place. I really wanted to use the veiling as an actual veil . . . but I just could not make it look the way I wanted for this project. 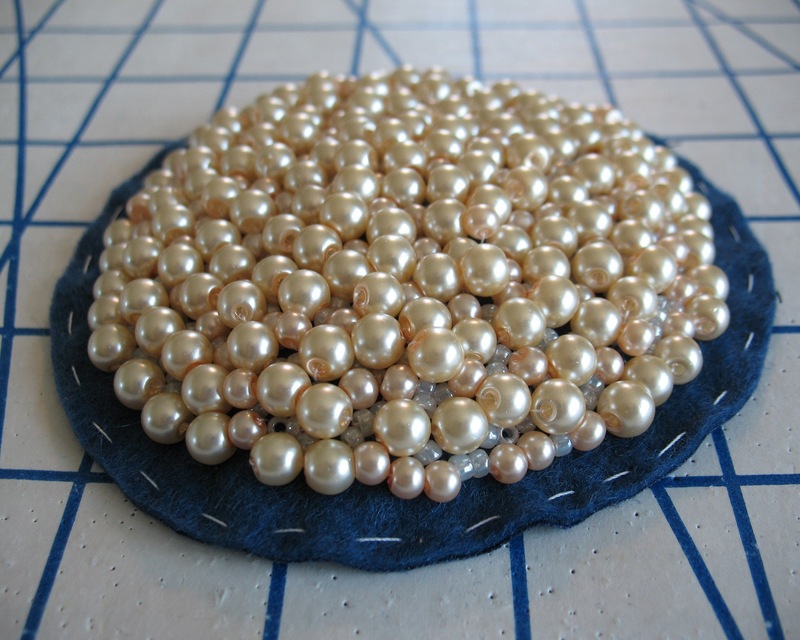 Instead, I added it as an embellishment to the pearl base. The final step was to add a couple of clips to the back for obvious reasons. It is a bit heavy (anything encrusted with beads is going to be), but the two clips kept it in place for the entire evening, so I would call this one a success! Absolutely beautiful. I think it's a perfect accessory. Well done. What a lovely little thing, really beautiful! And it looks really elegant with that bit of tulle. Beautiful job! I've found that the stiff (nylon? poly?) Russian veiling is simply to stiff to use as a real veil. 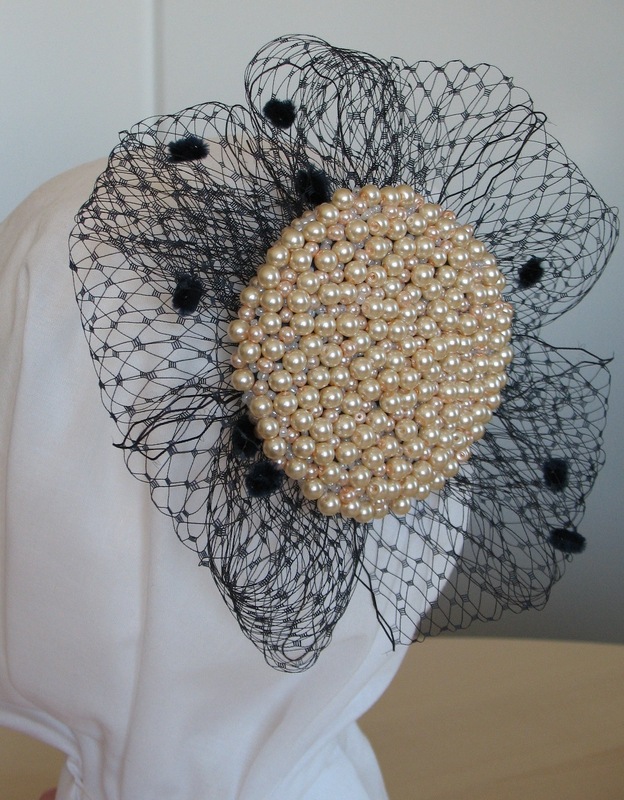 On Etsy, however, there are a number of sellers offering silk vintage veiling (unused). It might be worth getting for a future hat project. Wow, these are fabulous! 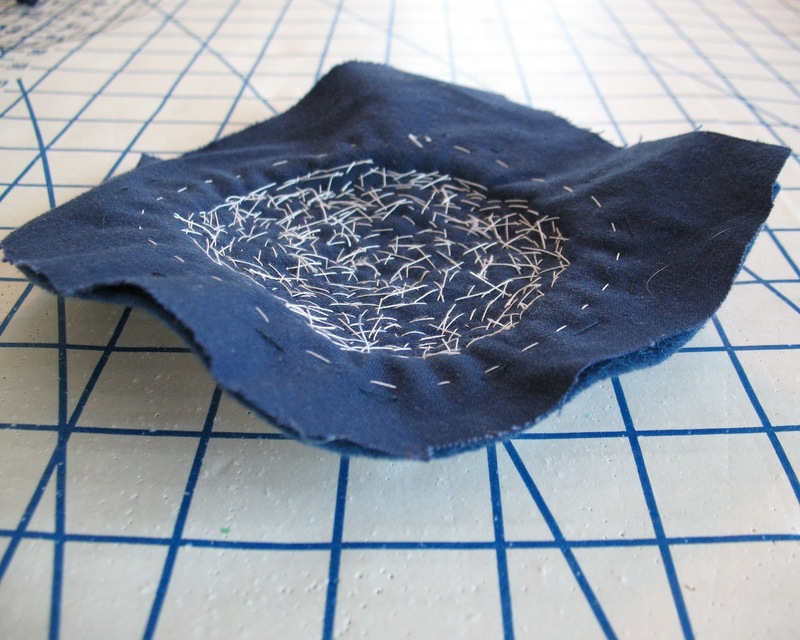 I love how you take the time to bead things by sewing, not glueing. Way more durable, professional-looking, and classic! Laura Mae, your brand only lacks a fragrance, and an affordable derivative found exclusively at a national retailer. We are almost midway through another year, and yet you continue to astound (at your signature unrelenting pace). Wowzer!! I am astounded at your output, quality and aesthetics - thank you. Wow you're beading skills are just awesome! Great necklace and hat! Lovely! 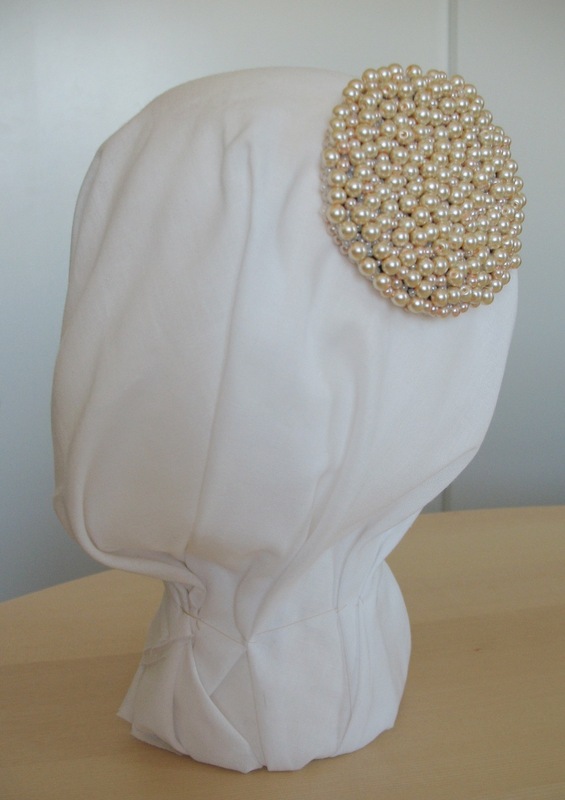 I do love pearls. 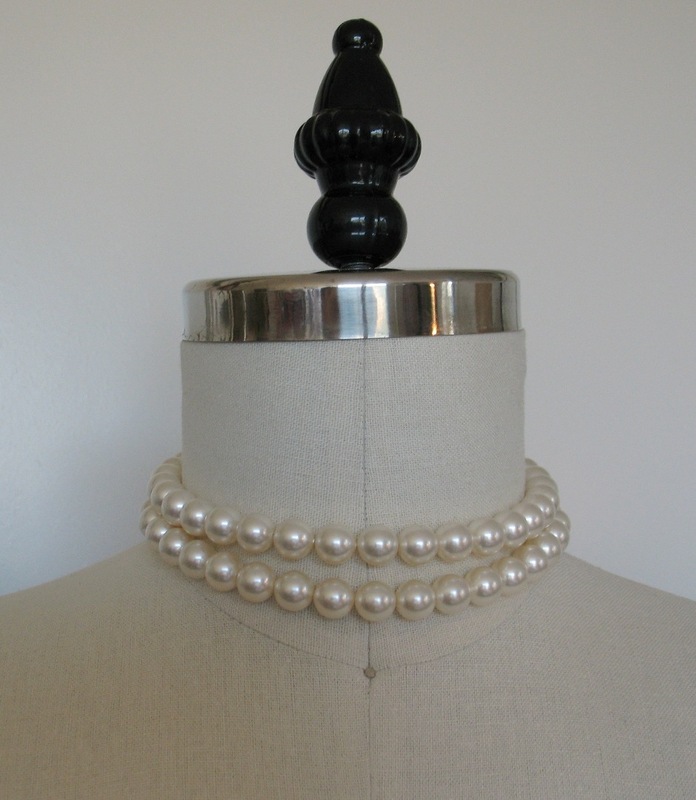 There is necklace of simulated pearls I haven't bought yet, but drool over regularly -- it is a reproduction of Jackie Kennedy's and they sell it on QVC -- not the choker length, though, more contemporary. I am amazed at your ability to pull an ensemble together, and I am dying to see the whole outfit -- that will be your next post, right? Don't torture us! I love pearls, too and the necklace that you restored so beautifully. Not such a fan of the headpiece. 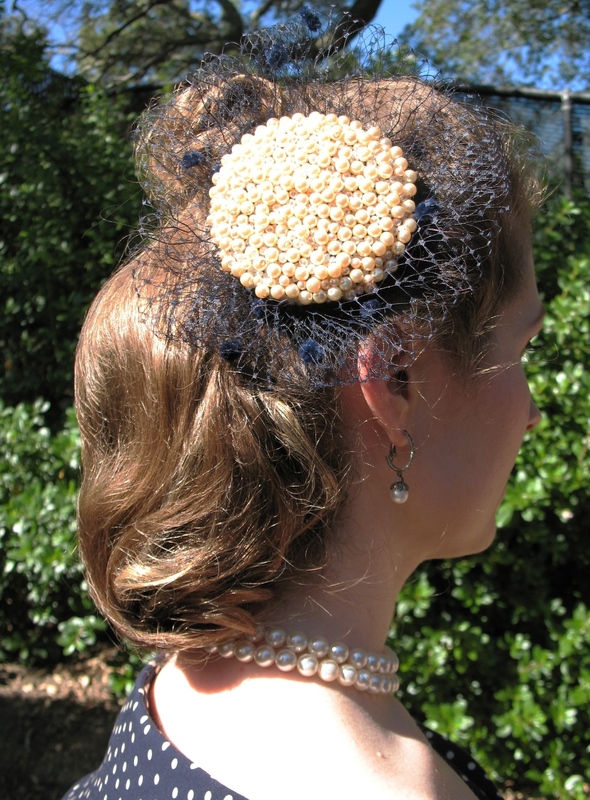 Love the pearls and seriously LOVE the headpiece. It's smashing, truly! I am in awe of your creativity. Your hair ornament is just lovely. I hope you won't think it impertinent, but I was wondering if you can give me some local knowledge. I am visiting San Francisco for 2 days in July, 22-24 (en route to Las Vegas) and I would love your tips on fabric shopping and anything else of note to see. I have heard that Haight Street is worth a visit for the vintage. I am staying at the Sir Francis Drake Hotel and envisage using public transport to get around. Congratulations on another successful recycling project. The result is beautiful. I'm busy taking apart old jewelry right now too, and recovering tons of great beads and findings. It's an incredible feeling to create something new out of these old found materials.